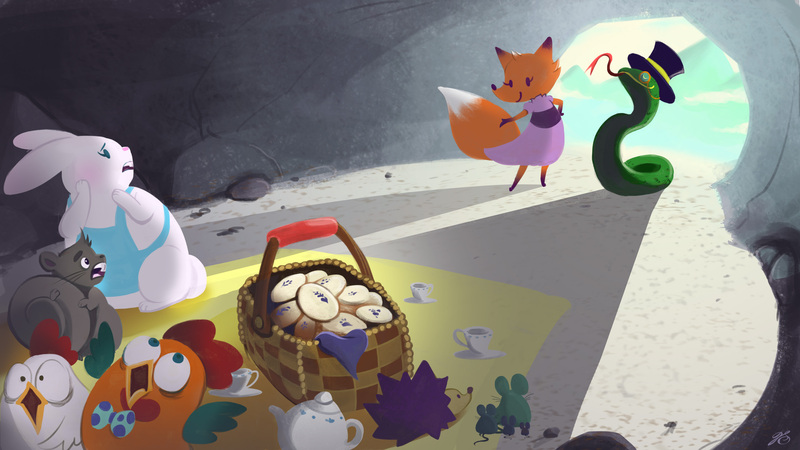 Kitara the fox was late to a tea party. As she dashed down the trail, her picnic basket swung from her elbow and the ribbons from her hat flapped behind her. Kitara skidded to a stop. There was a crowd of animals in the center of the trail pointing at the ground. As she got closer, she could see something brown stretched across the pathway – it was a snake! With a cliff on one side and a cave on the other, the snake was blocking the only way through the mountain. “The snake won’t move!” whispered a squirrel. “I need to make dinner for my babies,” worried a bunny. Kitara scratched up some dirt and flung it over the snake. It didn’t move. The bunny inched closer. “I think it’s asleep. I can’t wait any longer – my babies are hungry!” she declared. The bunny stomped her feet, wriggled her tail and tried to hop over the snake. “Who disturbs my sleep?” The snake hissed as it’s head snapped up. The bunny tumbled back behind the crowd. Everyone retreated a few steps, except for Kitara. Kitara looked the snake straight in the eyes. “Can you please move?” She asked matter-of-factly. The snake rattled its tail. “Did it occur to you that I might have a name?” He turned away dismissively and closed his eyes. “Ssssir Van Kenssssington” The snake interrupted. “Fine.” Kitara growled. She turned on her heel with a huff and headed into the cave. The animals exchanged concerned glances with each other. “He won’t move. What do we do now?” the squirrel asked. “Maybe we backtrack and find another way around” the bunny replied. She thumped her feet anxiously and stood with her arms crossed. The animals discussed in hushed tones. Then, the squirrel lifted his chin and sniffed the air. The breeze carried a fragrance that grew stronger and stronger. “What is that delicious aroma?” He asked. “Oh – I smell it too! I think I can smell cinnamon,”. The bunny closed her eyes and took a deep whiff. “Yes! It’s like a field of lavender growing in dirt made of sugar and cinnamon.” The sleeping snake opened one eye and sniffed too. Something did smell delicious. “I think it’s coming from the cave.” The squirrel said and scampered over. The rest of the animals followed. In the cave, Kitara was sitting on a blanket with a basket of cookies before her and a steaming hot cup of tea in her paws. “Oh hello there, would you all like to join me? I was heading to a tea party, but I thought I may as well have it here until that silly snake moves.” The animals laughed and came to sit on the blanket too. “What are you eating? It smells wonderful.” the squirrel asked, peeking into the basket. Kitara proudly waved a paw over her spread. “These are lavender snickerdoodle cookies that I invented myself. 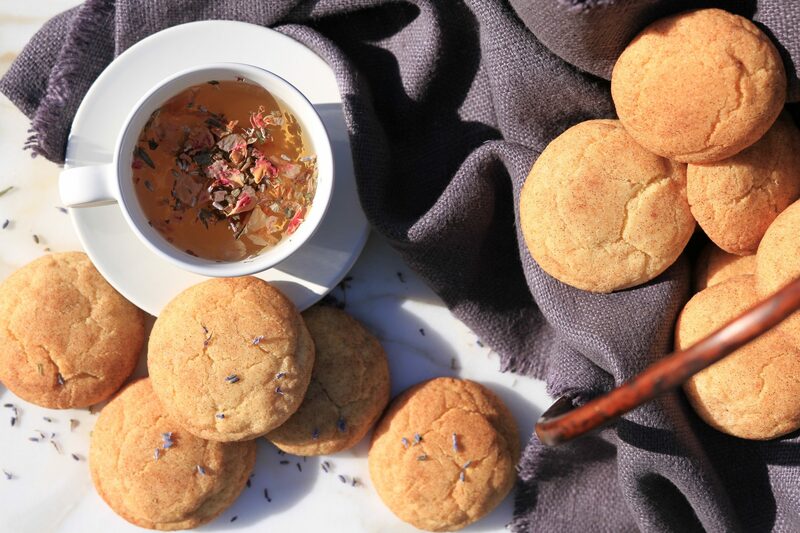 And a pot of lavender tea to go with it.” She distributed a cookie to everyone and poured a few more cups of tea. “Flowers in a cookie – what a fancy idea!” said the bunny. “I like it!” the squirrel managed to say through his puffed up cheeks. “Mmm…It’s so good!” the bunny praised. “I feel relaxed for some reason.” Her shoulders slumped back as she settled comfortably in a patch of soft dirt, sipping her cup of tea. Outside, the snake could hear everything. He leaned his head towards the cave as far as he could, without leaving his spot, to catch whiffs of the lavender cinnamon. He heard laughter and giggles.How dare they forget about me. The snake couldn’t take it anymore and slithered into the cave. “Give me some too!” he demanded. The animals turned and froze. Nobody said a word. “Why, if it isn’t Sir van Kensington…” Kitara purred. “What occasion brings you to honor us with your presence?” she smirked. “Those cookies are mine!” He reared up as tall as he could and flickered his tongue. “Oh, be my guest, there is plenty more.” Kitara said smoothly and then vacated her spot on the blanket for him. The snake glided over with his nose in the air and plunged his head into the basket. Bits of cookie flew everywhere. “Do you like it?” Kitara asked. “Mmm itsss quite… sssoooothingly sssweet.” The snake announced airly. He proceeded to eat all the cookies, though now at a slower pace. The squirrel and the bunny looked sadly at each other as all the cookies disappeared. “Oh good. I’m glad you’re enjoying the party. Please, eat as much as you’d like. Here – have some tea.” Kitara poured a cup of tea for the snake and then winked at the bunny, nodding towards the cave opening. The bunny caught on and slowly backed away and motioned everyone to follow. The snake slurped down the tea and started close its eyes. “Sssooo relaxxxsssing. Sssooo sssleeepy.” He nodded heavily and rested his head on the basket. The animals tiptoed out just as the snake fell fast asleep. “You are so clever, Ms. Fox!” The bunny giggled as they headed down the path. The squirrel came to give her a hug. “That was amazing! Thank you so much. Your tea and cookies were delicious. Good thing I didn’t eat that much or I’d be asleep too!” The squirrel chuckled. “Oh, just you wait…” Kitara teased. She waved goodbye and continued to her friend’s house. Kitara arrived just before nightfall. Her fox friends flung open the door. Kitara took off her hat and sat at the table. In a bowl of a stand mixer fitted with a paddle attachment, beat butter on medium speed for 10 seconds. Add the sugars and beat until mixture is aerated and pale in color, about 4 minutes. Crack eggs into a small bowl and add vanilla. In a separate bowl, whisk together flour, cream of tartar, salts and baking soda. With the mixer on medium speed, add eggs and vanilla and mix for 10 seconds. Scrape down sides and then mix for another 30 seconds. Add the dry ingredients all at once and mix on low speed until dough comes together, about 30 seconds. Cover and place dough into refrigerator to chill for 15 minutes. To make the coating, grind 1/2 cup sugar and lavender flowers together in a food processor. Add cinnamon and stir together. Remove dough from refrigerator and, using a 3/4-oz ice cream scooper (or your fingers), mold dough into balls. Bake for 12-14 minutes, or until the tops are just set and the edges are golden. Remove from oven and let cookies continue to bake on cookie sheet for an additional 2 minutes. Cookies can be stored in an airtight container at room temperature for up to 3 days or up to a month in the freezer. Be sure to use culinary grade lavender. Do not eat flowers from florists, nurseries or garden centers because they may be treated with pesticides and are not labeled for food crops. 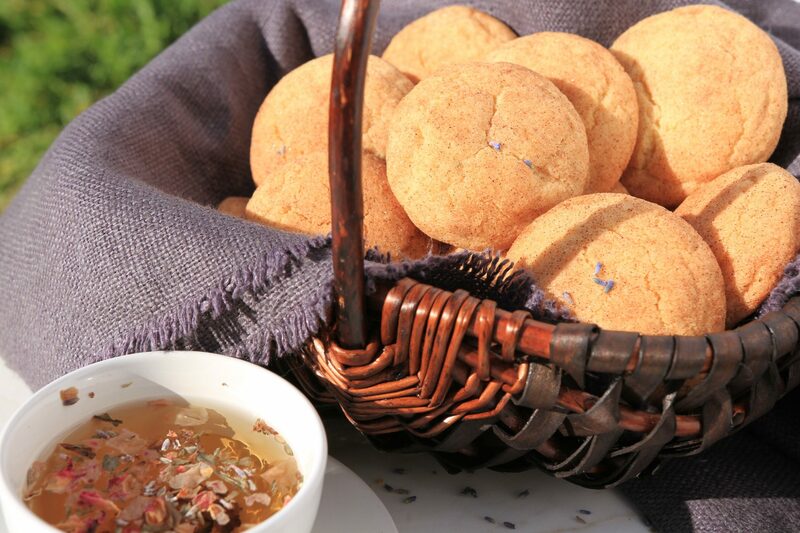 Culinary lavender can be a condiment in salads and dressings, used to flavor baked goods, desserts, stews and wine-reduced sauces, blended with teas or sprinkled as garnish. But adding too much lavender to your recipe can be like eating perfume and will make your dish bitter. The secret is that a little goes a long way. We found that the lavender fragrance was subtle and barely detectable in the cookies when we tried them out of the oven. But we really enjoyed the cookies when the lavender fragrance grew stronger in the following days. To make lavender sugar, simply put lavender flowers and sugar in a tightly sealed container for a couple weeks. We didn’t want the lavender scent to be too overpowering, so we used two tablespoons of lavender flowers (in a tea filter sachet) with one cup of sugar and we let it sit in a container for only three days. Lavender is a flowering plant in the mint family. Essential oil extracted from the flowers has a calming and refreshing aroma that can be used to help people relax and sleep. Studies and tests have shown that lavender reduces stress and anxiety, and can even relieve headaches. Unlike culinary lavender, the essential oil of lavender can only be applied topically or inhaled using aromatherapy – it should never be eaten. This story was inspired by my aunt who witnessed a squirrel fling dirt repeatedly over a snake that was stretched across a hiking trail in order to get it to move. The recipe was inspired from accidentally eating Honey Lavender ice cream and Ricanelas ice cream in the same bite at an ice cream shop one day (Ricanelas ice cream is a Mexican cinnamon ice cream with bits of snickerdoodle cookie). At first we thought that the two strong flavors would clash and perhaps one would overpower the other, but they ended up balancing each other instead. It was delicious! This looks so delicious! I cannot wait to try this on a hot summer day! Thank you so much for the lovely story and recipe, Tracy!